Formed in 1932 by an English expatriate by the name of Frank Gordon, Miramar Golf Club is recognised as the third oldest club in Portugal. Along with Oporto, Lisbon Sports Club and Estoril, the club founded the Portuguese Golf Federation in 1949 so its historical importance should not be underestimated. 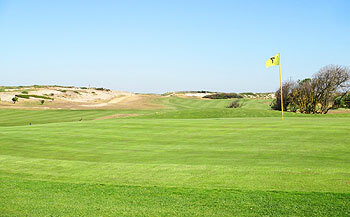 Laid out on coastal land between Espinho and Porto, the 9-hole course at Miramar was designed by Philip Mackenzie Ross shortly after the club was established. Apart from some upgrading work carried out by Howard Swan’s design company in recent years, the layout today is much the same as when it was first set out over 75 years ago. With only one par five at the 8th hole, the course measures just over three thousand yards in length with its six par fours varying from 292 yards at the 7th to 399 yards at the 3rd. Both short holes on the course are played with the prevailing wind at your back so marking a three on the card should be achievable for most golfers, even at the semi-blind 5th, which is played to a punch bowl green. This is a delightful little links course. It is very a very traditional members' club with a challenging course in a tight piece of land alongside the beautiful beach. A short but good opening par four is followed by a 200 yard plus par three and an exceptional 3rd hole. It is a slight dog-leg right played to a green near the sea. The 5th is a beautiful par three played to a green in front of the clubhouse. Take care on the 7th as the green is a table top and it is very easy to put off both sides. The 8th hole is a fine par five played along the shore with a ditch to carry near the green. The course finishes with a strong par four. Well worth playing here. Stepping onto the property, you can tell straight away that this is a place for golfers; just like Oporto and Estela along the coast, you’ll be hard pressed to find a buggy around the clubhouse as players don’t ride the course here, they walk it. And what a fine old track they have to stride out onto! The par fours at 1, 3, 6 and 9 all face to the north and they’re as tough as old boots to tackle when the prevailing wind blows. The tee box on top of the dune ridge at the 7th is located at the highest and most memorable position on the course, looking back from the beach to the clubhouse. It’s the start point for a hole that doglegs left to one of the most difficult, crowned greens (pictured) that I have ever seen – I wonder if it’s an original as it appears rather old-fashioned to me? Take time to inspect the interior of the clubhouse upstairs when you finish your round here as there’s loads of trophies and other mementos in various nooks and corners, each of them with a story to tell about what makes Miramar such a wonderful wee golfing enclave.